One might argue that a disproportionate amount of research examining the tepid market reforms in post- Soviet Cuba emphasizes the island’s second economy (Pérez-López 1995), cuentapropistas (Peters and Scarpaci, 1998) and related gray areas of commerce and consumption (Weinreb, 2009). A paradigmatic assumption driving this research is that the ever-resourceful Cuban will make ends meet (resolver, solucionar) through whatever means possible. Necessity drives many Cubans to the black market. Even contemporary assessments about the island’s incremental liberalizations are dour: microenterprises will lead only to a sort of “kioskization” of the service sector, therefore stifling any real economic growth. While a good deal of remittances fuels those sectors of the economy, state-run retailing continues to absorb hard currency (Morales 2008). Although the number of retail established tumbled from around 60,000 in 1959 to around 4,000 in the early 1990s, the trend of retail outlets is on the uptick. Less is known, however, about the ways Cuban consumers interact with these multi-billion dollar enterprises. This paper aims to capture in-store and across-store consumer attitudes about prices, sales staff, and retail settings, and then situate those findings in selected retail-services marketing literatures. I begin with an overview of recent changes that have contributed to the deepening of state-run retailing. The main body of the work presents fieldwork findings of consumer interactions in four of the capital’s largest shopping centers: Harris Brothers (Havana Vieja), Carlos III (Centro Habana), Galerías del Paseo (Plaza-Vedado), and Comodoro (Miramar). A comparison of prices among selected durables follows as does the preliminary findings of in-store assessments by 191 customers. Results indicate that higher-priced goods produce an extended search process by the buyer, although the uneven supply of goods on store shelves often leads to on-the-spot purchases of three-figurepriced items. Consumers continue to rely on in-store promotions, word-of-mouth (WOM) reviews, and anecdotal evidence from reference groups (friends and family abroad) in honing their purchase decisions. Moreover, shopping center amenities are notably different among the four cases studied here, and attract decidedly different clientele driven largely by proximity to the site. To situate the discussion, we turn to a brief overview of legislative changes in the past few years. Decriminalizing the dollar in 1993 reversed the trend of dwindling retail establishments and made the previously restricted diplo-tiendas widely available to any Cuban holding hard currency. A decade later, the adoption of CUCs (convertible hard currency), ditching the U.S. dollar, and embracing the Euro as the preferred foreign currency against which CUCs could be exchanged, prompted Cuban holding companies and retailers (CIMEX, TRD, Poder Popular, Habaguanex, Palmares, Isla Azul, and Artex among others) to diversify their food and consumer good establishments across the island. Conventional interpretations of retail growth and diversification point to clear market signals about the need to segment retailing based on opportunities for market expansion. Little is known, however, about the logic behind the state’s thought process and marketing strategies. For example, while the State Council administers CIMEX and Cubalse, and the Revolutionary Armed Forces control TRD-Caribe, it is difficult for outside analysts to comprehend how those state political entities enjoy particular core competencies in retailing; clearly the topic of another research paper. Nonetheless, between 1993 and 2006, the number of retail stores increased 100%, yet had only achieved one-sixth of 1959 levels. Between 1959 and 1964, the number of retail outlets declined by more than half, mostly because of the abolition of private property and enterprises. When peso hoarders (macateros) were allowed to “come out of the closet” in 1993, slightly more than 4,000 state-run stores existed to welcome the newly de-demonized hard currency. 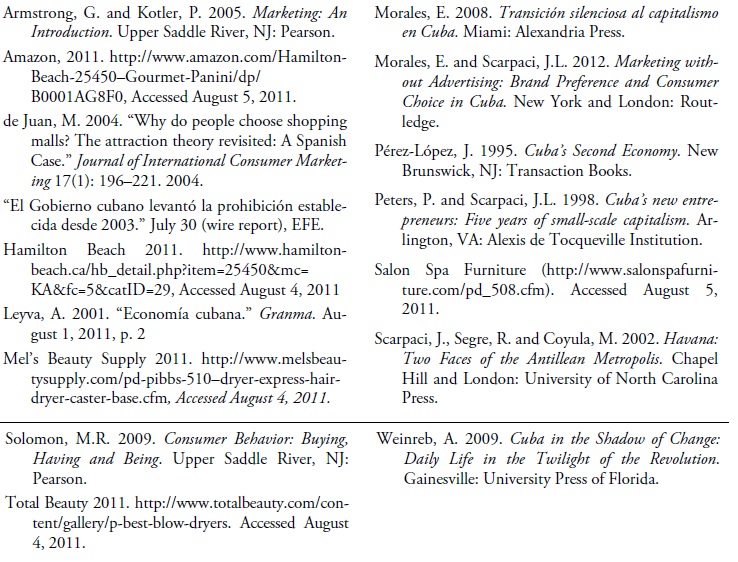 Fast-forward 14 years and some 5,000 new retail establishments were operating (Morales and Scarpaci 2012, Chapter 2). Despite the relative plethora of state-run hard-currency stores in Cuba today, it is still quite easy even for the casual observer to distinguish traditional retail shops that sell in pesos from those selling in CUCs. The former have less attractive in-store displays, poor quality merchandise, and less catchy window and instore display of wares. At the same time, it would be an error to conclude that the Cuban government runs the equivalent of Wal-Mart or Target while the peso-run establishments have the appeal of, say, Dollar General or the Dollar Store. Hard-currency shops are still relatively small in terms of square footage, and there is nothing comparable to the big-box store of, say, 80,000 square feet anywhere on the island. Nor is there any retail logic about what can and cannot be sold. Witness, for instance, a recent proclamation in Granma about how commercial-level (e.g., heavy duty) appliances will now be sold to assist private businesses. The Ministry of Interior Commerce agreed to sell appliances that could be generally used in food and other services, as a sign of the government’s will to continue helping the practice of self-employment… Said articles will gradually be incorporated as they are acquired by the [state] entities in charge of selling them (Leyva 2011, 2; my translation and emphasis). it was also agreed that these measures should consider in the buying process the least amount of diversity possible in terms of brands, models, parts, and accessories with the aim of simplifying servicing [product] guarantees and post-sale services (Leyva 2011, 2, my translation and emphasis). In other words, the paternalistic State knows best and aims to generate a sense that the private sector should be grateful for these concessions. Regardless, that state stores have begun selling some wholesaleand commercial-like goods in quantities—in a country where the lack of wholesaling has been a major criticism by self-employed workers (Peters and Scarpaci 1998; Scarpaci 2008)—is a significant development in Cuba’s retail marketing. To be clear, these items are not inexpensive. It is difficult to imagine how the historically low monthly incomes (around the equivalent of $25 USD) of the average worker, or even the savings of multiple household wage earners, could afford these commercial goods. A sampling of a few items provides perspective on the state’s high mark-up on certain goods: 75–liter rice cooker—$479; Hamilton Beach commercial blender—$425; Hamilton Beach deep fryer—$235; and an upright commercial-grade hair dryer—$630. 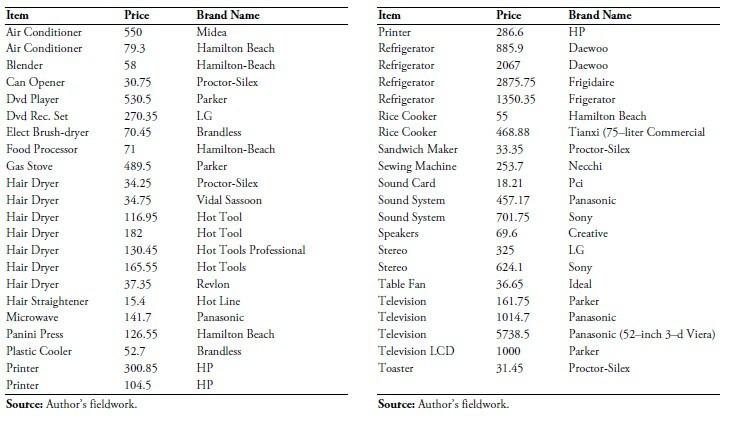 A systematic comparison of prices of selected appliances comes later in the paper. 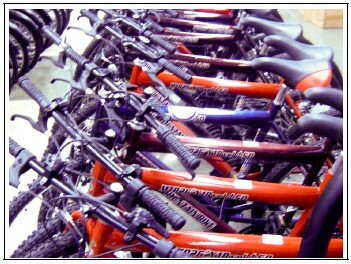 We work to satisfy our customers’ and business clients’ expectations and to be the benchmark for retail services. We aim to deliver quality service with competent personnel, provide contemporary and varied goods, and bring high-demand products to the neighborhood. To that end, we implement an ongoing Quality Control System based on Cuban Law NC ISO 9001:2008 which assures effectiveness in our processes and continuous improvement (my translation). While statements such as these are commonplace in other market economies, their presence in contemporary Cuba present a pastiche of market retailing and consumer-centered service. The shopping centers and their management vary considerably. The oldest and most difficult to navigate is Harris Brothers, at the edge of the Habana Vieja, next to the iconic Bacardí building, and just a block from both Parque Central, Prado boulevard, and the pedestrian promenade Obispo. 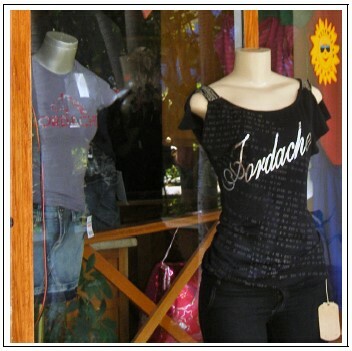 It dates back to a retail store established by American entrepreneurs in the early 20th century. The City Historian’s commercial division, Habaguanex, took it over and revamped it for retailing in the 1990s. The shopping mall Plaza Carlos III is designed with an open food court facility in the middle with a single, upwardly spiraling ramp along its periphery that climbs four floors (called a caracol or seashell; quite common in Chile and other South American countries). It is the most geographically central location of the four shopping centers studied and is the island’s largest shopping mall. It is equipped with a Western Union office, the state airline ticket office, and—for most Cubans—a dizzying array of consumer goods. The Galerías del Paseo, the third facility, was built in the mid-1990s in tandem with the revitalization of two hotels at Paseo and Malecón. One hotel is the 1957–built Hotel Riviera, whose adjacent facility, Meliá Cohiba, was built some four decades later. The Galerías del Paseo is a dark-glass wrapped three story mall which, like Carlos III, houses about two dozen stores along a spiral concrete walk way that gives access to a super market, pet food and supply store, hardware store (on the ground floor whereas at Harris Brothers it is on the top floor), electronics goods, and a variety of general and specialty clothing and gift stores (Figure 3). Its striking façade prompted urban designers and architects to nickname it the “bat mall” because two small turrets rise up like “ears” on what appears to be the dark mask of batman (Scarpaci et al. 2002). It taps into retailers in the once bourgeoisie community of Vedado. Formerly owned by Cubalse, TRD now manages this Vedado shopping mall with 21 establishments. The fourth shopping complex, Comodoro, might appear anywhere in the U.S. Sunbelt. It combines open-air pedestrian walkways and gardens that encircle two stories of retail establishments. It is located in the former Barlovento section of Miramar, once an open area of more than 40 city blocks that contained only two oceanfront hotels. In the 1990s, the International Trade Center complex and several hotels (Panorámico and Novotel) were built in the area and transformed it into a dollar-only area aimed to attract tourists and satisfy the needs of foreigners working with joint-venture companies as well as Cubans with access to hard currency. Consumer behaviorists often classify the stages through which buyers pass as they attempt to satisfy a given need. They may move quickly or slowly through these stages, and there is even evidence that these stages can be reversed. In confronting new products, a setting common throughout Cuba given the revolution’s legacy of creating material scarcity, the adoption process is conceptualized as moving from awareness, interest, evaluation, trial and, finally, to product adoption (Armstrong and Kotler 2005, 163–64). Such a “rationale” or mechanistic modeling of consumer decision making may be inapplicable to Cuba because of its low purchasing power and monopolistic retail environment. To date, however, little research has addressed these and related questions, a topic we turn to in the sections below. While I was in Cuba conducting fieldwork in July and August 2011, the Cuban government issued a dictum that further liberalized the sale of once highly regulated or restricted goods. These include selected household appliances such as air conditioners, ovens, and electrical grills. Underscoring of the state’s benevolent attitude, the government’s Gaceta Oficial explained that the Ministry of Interior Commerce’s (Ministerio de Comercio Interior) rationale behind these liberalizations was in “response to the population’s needs and the private sector…especially in the food sector” (“El gobierno,” 2011, my translation). At first blush, selected products stand out as both unusual for regular household consumption needs as well as for their seemingly high prices. For example, a rather small (0.7 cubic feet) Panasonic microwave (NNST, 250 watt) lists for $142.65, while Wal- Mart’s website in the U.S. listed a 1.2 cubic foot model for $129.80. A hair dryer by Vidal Sassoon sold for $34.75 (model VS 547 1875–watt Professional Full-Size Ionic Dryer), while the same model appeared for $19.99 at a beauty products U.S. website (Total Beauty, 2011). A professional mounted hair dryer (Dry Fast Pibs No. 508) targeted for the growing home beauty salons sprouting up across the capital (Figure 5) listed for the hefty price of $631.65. An online search could not find many retail listings for the U.S. or Mexico, but it did find one beauty-salon supplier who listed the same model as “discontinued” and for 41% less ($375) (Salon Spa Furniture 2011). Another firm listed it for $435 (Mel’s Beauty Supply 2011), which was still nearly a third less expensive than the Cuban price. 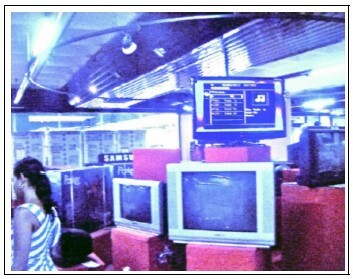 Computers and related equipment registered particularly high prices. A fairly common HP ink-jet color printer sold for $300.85 but comparable online prices in the U.S. hovered in the $60–dollar range. The only computer I saw was an Asus mini-notebook model selling for $645.35, while the identical model existed for $428 new, with used models starting at $228 (Google 2011). These computer items carried a hefty price, perhaps because the government fears that anti-government information will be disseminated. Lastly, a Hamilton Beach Panini press (ideal for Cuban sandwiches) carried a price tag of $126.55; Amazon carried the same model for a third the price (Amazon.com 2011). No doubt, decisions behind these higher prices reflect the state’s justification for adding a mark-up to cover socialist benefits of universal health-care, subsidized food, and free education. The implications of such pricing, however, are beyond the scope of this discussion. Three rather axiomatic conclusions stem from this small price sampling even though the sampling of non-Cuban prices come from online versus brick-and-mortar establishments. First, Cuban state retailers charge more for their products than do the U.S. and Mexican counterparts. Second, many of the models are apparently older models, and may allow the Cuban government to receive greater price discounts for these earlier renditions. Third, the retail convention of setting prices at 99–cent level (e.g., $19.99) is not followed in Cuba. Instead, unusual price points set at 35-, 45-, 55-, 65-, and 75-cents prevail in the island’s pricing practices. A detailed compilation of consumer durable prices appears in Appendix 1. A related phase of the study of consumption, service quality and prices then examined shoppers’ time spent comparison-price shopping and its relationship to the price of the consumer durable that was purchased. A surrogate measure for “time spent shopping” was the number of visits buyers made to other stores to check on prices, or information gathered from other stores that was given to them from significant others (friends or family) about the price of the product ultimately selected. Two Cuban graduate students administered the survey by asking two simple questions to customers who had just completed a purchase in one of the four Havana shopping centers: (1) how much was the product you just purchased? and (2) from how many other stores had you, friends, or family gathered comparable prices? A Spearman’s rank correlation coefficient of rs = .765 at the p <.01 significance level revealed a strong and positive relationship between price and the “extended search” (i.e., background information gathering on price, product quality, and related product attributes). The finding corroborates a widely held axiom in consumer behavior that assesses the relationship between background searching and price. A second in-store assessment asked roughly the same number of shoppers in each shopping center (Harris Brothers, n=47; Carlos III, n=48; Galería del Paseo, n=49; and Comodoro, n=46) who had just purchased the consumer product discussed above. If a shopper had never been to the facility, they were eliminated from the survey. The question posed was: How would you describe the quality of shopping in the following places? (Cómo describriría Ud. la calidad del shopping en los siguientes lugares? ): Harris Brothers, Carlos III, Galería del Paseo, and Comodoro. A standard Likert scale was used: 5=excellent, 4=very good, 3=average, 2=bad, 1=very bad (Table 1). Next, a quick battery of questions about retail attributes for the same shopping centers was asked. Attributes were the informal setting, variety of products and services, the extent to which it was uncrowded, cleanliness, ease of browsing, and low prices. Respondents agreed that none of the establishments offers low prices. As expected based on retail standards, the Comodoro rated highest for having professional staff, being uncrowded, its cleanliness, and ease of browsing. At the other extreme, Harris Brothers, located in the oldest part of the city, rated highest with “informal setting” but lowest on the “cleanliness” scale (Table 2). This finding underscores that the caliber of the retail environment is aligned with status symbols; they “signal membership in a desirable social class” (Solomon 2009, 666) and facilitate the retail experience. It also supports de Juan’s (2004) work in studying shopping mall preference in Alcántara, Spain with the noticeable difference that private automobile driving time is not a key factor in the Cuban case because most of the island’s shoppers walk or take public transportations. Price is a ubiquitous concern for shoppers around the globe. Because access into the managerial thinking by Cuban officials who set prices is not possible, this research can only take an inductive approach in trying to understand the logic of retail product supply, distribution, and pricing. Havana shoppers participate in extended problem solving within the means available to them. They employ a rational and elaborate decision-making process in which they aim to minimize their risk by gathering as much information as possible (in this case, about price) before making a purchase. A standard consumer behavior corollary— the higher the price the more elaborate the extended problem solving ensues—is borne out by this study. However, it would be premature to conclude that the conventional stages in the product adoption process noted above (awareness, interest, evaluation, trial and adoption) are evident in Cuba. On many occasions, interviewers were told that they had purchased the product about which the interviewers were inquiring about simply because the product had showed up, and they had no idea the quantity of supplies or the next time the product might show up in stores. One young couple had just plunked down over $500 in cash for the purchase of a Chinese brand widow airconditioner unit. “We came here looking for a refrigerator but we’ve also been looking for an AC unit. We have to take advantage of it now; the summer is hot, and we have the cash now. Who knows about tomorrow?” In general, though, consumer behavior explored in this study aimed to minimize post-purchase regret, a behavior particularly important in contemporary Cuba because of the low household incomes and the scarcity of consumer durables. My findings also indicate that there appear to be no significant variation of pricing among the four shopping malls in review. Admittedly, the state constrains variety seeking because of its dominant role in setting prices and locating retail stores. Cubans have little recourse in choosing new retail alternatives over the traditional state-subsidized peso stores, the latter known for their lower quality products and reduced product variety. However, Cuban shoppers tune into the retail amenity cues such as cleanliness, in-store service and related attributes. Shopping center assessment appears to be strongly and positively related to price and the perception of a more aesthetically pleasing shopping experience. Put another way, consumers react favorably and positively to the in-store retail environment, which is strongly related to their perception of retail staff. These tentative findings also suggest that the higher the price, the greater number of stores Cuban shoppers visit to compare prices. This would appear to be normal consumer behavior given that there are no on-line price comparison websites (e.g., PriceGrabber), newspaper coupons, sales promotions, or other conventional promotional and advertising strategies used in market economies. This research also corroborates the role of in-store promotion in consumer decision making in a country where there is marketing without advertising (Morales and Scarpaci 2012). Future research should be extended to places outside the capital city where, admittedly, the concentration of remittances is less, and there is less variety of retail merchandise. Although economists and business analysts will continue to debate about the extent to which Cuba is a transitional economy—that is, adapting from a centralized economy to a free-market system (Solomon 2009, 668)—the consumer behaviors described here align with a large body of literature about consumer decision making in market economies. Cuban consumers continue to develop their price information and tastes from an unconventional sources and do so within the logic of a unique retail context. About Joseph L. Scarpaci, Jr.